So I planned to change my sim only plan on Black Friday but was too busy with work and that and only found time today to sort it as telephone waiting times were crazy. I spotted the 25gb deal posted and thought it was ok for £21.99 but it has expired. Today I rang EE and asked if they could price match a 3mobile sim only deal which obviously they don’t do so I told them unless I can get a good deal today on a new sim only deal I wanted my PAC number. I was offered 30gb data, with unlimited minutes and texts on a 12month contract for £17.99 a month on their super fast 4gee network (this is important as their other large data deals they offer are limited to 60mb/s, always read the small print). I don’t have to go through the hassle of changing networks and EE coverage and speed is great in my area (I work all over Ireland, north and south). 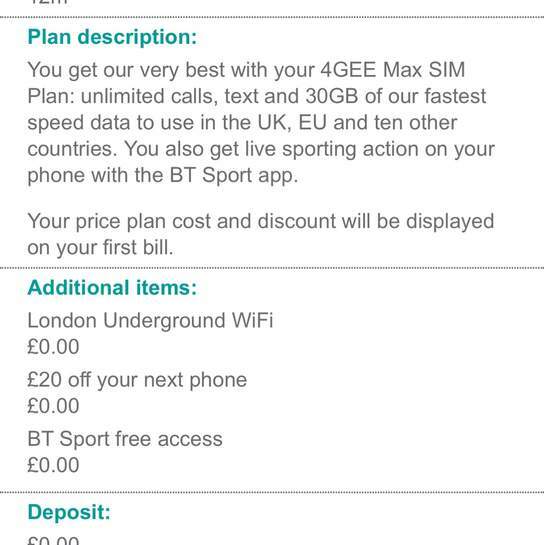 So if you are on EE and are looking a sim only deal, I would advise you call and see what they can offer you. I have included a photo of the breakdown of the tariff as shown on my account. It should have been £41.99 a month and I got it for £17.99. One of the good things about EE and using an iPhone is that when you are in a building with no mobile reception but are on WiFi, you can then make a EE WiFi call which is near sure not all other networks offer. But be aware, if you do not contact them a few days before your contract is up in 12months, the 13th month will be billed at £41.99. I have already set several reminders and alarms a day before my contract expires. I got this about a month ago too. Great deal! Can't wait to drop down to simonly in 5 months. This would be ideal. Don't want to leave EE as the coverage is great and speeds on MAX plans are so good. It’s actually better than the Black Friday deal. Mine came with BT sport's too. Might want to include that. Can't wait to drop down to simonly in 5 months. This would be ideal. Don't …Can't wait to drop down to simonly in 5 months. This would be ideal. Don't want to leave EE as the coverage is great and speeds on MAX plans are so good. £11.99 ? Did you post that deal ? All though it's a good deal, effectively they put you on £41.99 and put the discount on manually. Meaning if you do an early upgrade you haave to match the 41.99 or above. Are you sure? EE doesn’t normally do time limited loyaltyoffers. Is there an expiry date showing if you check the add-ons in MyEE? I got the same deal with Bt sport about 5 weeks ago. Can use the data for tethering (abroad)which was great for the data hungry step daughter. Had this for a few months now, good value. EE's loyalty discount does not disappear after the contract is up, it just rolls on until a new contract is agreed or its cancelled. All though it's a good deal, effectively they put you on £41.99 and put …All though it's a good deal, effectively they put you on £41.99 and put the discount on manually. Meaning if you do an early upgrade you haave to match the 41.99 or above. @JarrodWRX But be aware, if you do not contact them a few days before your …@JarrodWRX But be aware, if you do not contact them a few days before your contract is up in 12months, the 13th month will be billed at £41.99. I have already set several reminders and alarms a day before my contract expires.Are you sure? EE doesn’t normally do time limited loyaltyoffers. Is there an expiry date showing if you check the add-ons in MyEE? On ee sim only plans you don't have to pay to upgrade at any point.... their phone contracts you do. Check in my EE. I have £ loyalty discounts (no expiry) and also a 50% discount which does show an expiry. click the > at the end of each line, no date means it’s an open ended add on. EE contract rates never go up once applied to an account, there is an annual inflationary escalation clause, which is very fair and will make a difference of pennies each each month. Once you receive a tariff rate you’re locked in until you cancel or renegotiate. The downside to this is when you sign up for a handset contract deal, the price of the handset is baked in to the monthly price, so once the minimum term is up, unless you cancel or renegotiate,you’re handing over a chunk of cash for no good reason. 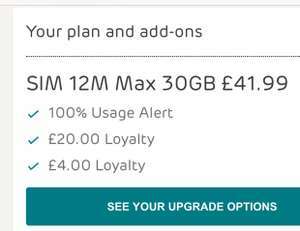 I can confirm that the discounts are ongoing aslong as you do not change your plan, I got a similar deal 13 month ago, 12 month Max Plan with 20GB 4GEE, unlimited calls and texts for £15 a month, my contract is now over, however the discounts are still on my account. I asked a member of staff when I got the contract, they said technically it is a 12 month deal, but the discounts which are added do not have an expiry, so can only be removed from my account if I change my plan or if a member of staff manually remove the discounts. As long as you’ve clicked each > and none show dates then you have no expiry date for the loyalty discounts (which is normal EE procedure). With SIMO you can go down tariffs too, wouldn’t make any sense to keep you going up as you’d just leave. With SIMO you can go down tariffs too, wouldn’t make any sense to keep you …With SIMO you can go down tariffs too, wouldn’t make any sense to keep you going up as you’d just leave. Only after 12 months. You can't reduce your tarrifs during the 12 months. EE's best selling iPhone X plan is £83 a month. I can confirm that the discounts are ongoing aslong as you do not change …I can confirm that the discounts are ongoing aslong as you do not change your plan, I got a similar deal 13 month ago, 12 month Max Plan with 20GB 4GEE, unlimited calls and texts for £15 a month, my contract is now over, however the discounts are still on my account. I asked a member of staff when I got the contract, they said technically it is a 12 month deal, but the discounts which are added do not have an expiry, so can only be removed from my account if I change my plan or if a member of staff manually remove the discounts. Great deal. 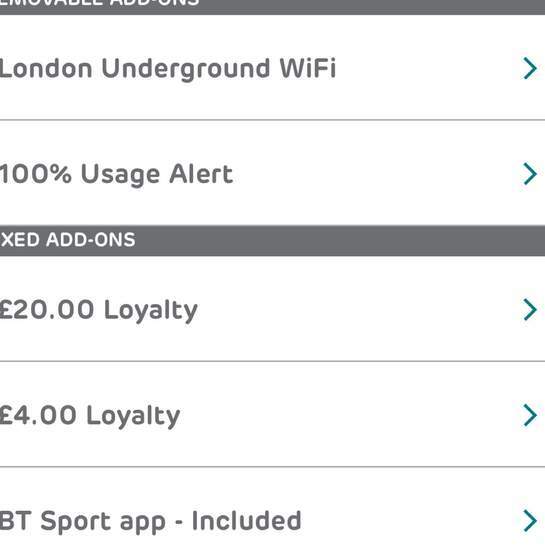 EE loyalty discounts don’t expire and will only be removed if you upgrade your contract. The only increase on the plan will be the annual RPI increase in March. I’ve a loyalty discount on my account which has been on my account for over 30 months. The 13 month will not be billed at £41.99. Loyalty will remain until you upgrade. Great deal. 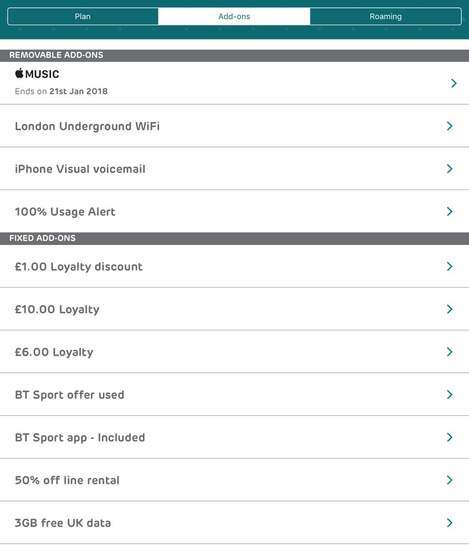 EE loyalty discounts don’t expire and will only be removed if y …Great deal. EE loyalty discounts don’t expire and will only be removed if you upgrade your contract. The only increase on the plan will be the annual RPI increase in March. I’ve a loyalty discount on my account which has been on my account for over 30 months. I think this has changed, like I said in an early post my 12 months came to an end and £10 extra was added to my bill. I called billing and asked why my bill gone up, they said because I had a retentions discount that was added for 12 months and now that the 12 months has ended the discount has been removed, I argued that I had been with T-Mobile/ee doing retention deals for over 12 years and this had never been the case as the discounts roll on. In the end it took a good 20 mins of back and forth before they decided to 'waive' the extra £10. I’ve not had that experience so far on 3 SIM only plans with loyalty so far. It’s worth checking if the loyalty discounts have an end date. I’d the experience of customer service telling me the discount will end after 12 months but the discounts continued after 12 months.